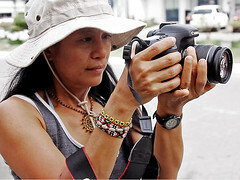 Davao City, Philippines — Five Mindanao-based photojournalists underwent a four-day advanced multimedia training from February 20 to 23 to prepare them for the Panglantaw Mindanao multimedia project 4. The participants, all alumni of ACFJ’s Diploma in Photojournalism program, included Jose Aurelio Lozano, Rommel Rebollido, Pamela Chua, Froilan Gallardo, and Glocelito Jayma. Also present were the project’s management team, Bj A. Patiño and Alex Baluyut. The course was handled by Peter Carney, multimedia journalist and academic based in Beijing who is also a faculty member of ACFJ’s Diploma in Multimedia Journalism program. Panglantaw Mindanao: Stories by Mindanawans, is one of the projects under Press Freedom 2.0, a program of an alliance of four Dutch NGOs led in the Philippines by the World Press Photo. Also involved in the program is the faith-based NGO, Mensen met een Missie. 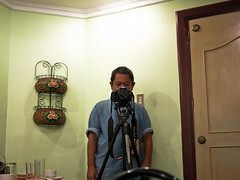 Canon Marketing Philippines gave its support of the training by lending DLSR cameras and lenses. On the first training day, Carney discussed the fundamental differences between traditional and online media. He emphasized in particular the latter’s more dynamic nature as far a presenting content and connecting with audiences are concerned. He said that newspapers “think in a very narrow way” and that they were missing out on an ongoing “media revolution.” Carney identified the multimedia shooter as the one best poised to thrive in this new context, being equipped—unlike the plain photographer—with skills in shooting, editing, and producing video. 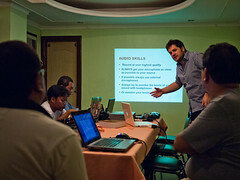 On the second day, the workshop group learned about the integral part that audio plays in video. This involves sound quality, the inclusion of key and ambient sound, and various techniques needed to properly record them. They also learned the proper way to conduct an interview in order to get answers most useful when editing. All of these were applied the next day when the participants went out in small groups for a practical shooting exercise. 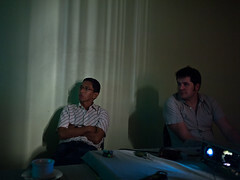 On the last day, the participants edited their footage in the morning and presented them in the afternoon. In attendance for the viewing were representatives of ACFJ’s partner in Mindanao, the Mindanao Peoples Peace Movement (MPPM), who also discussed with the photojournalists some story ideas. Panglantaw Mindanao aims to profile Mindanao news and issues through multimedia stories. Ultimately it seeks to foster cooperation between the news media, civil society and ACFJ to promote good governance. 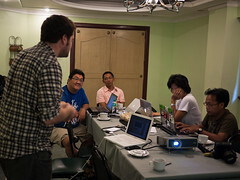 Share the post "Photojourn alumni undergo multimedia training for Panglantaw Mindanao"